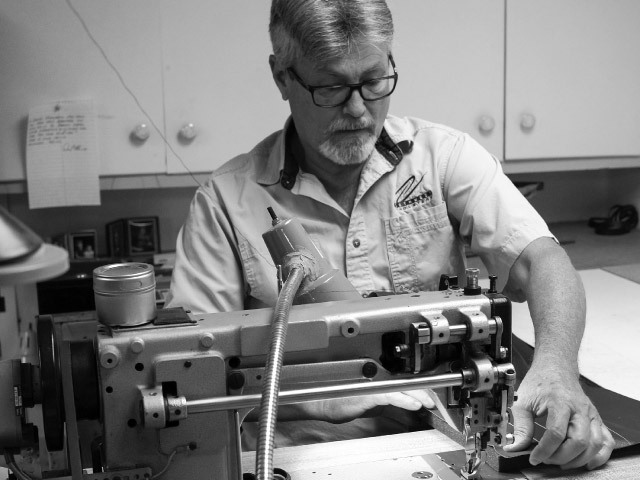 At the industrial sewing machine in his shop, David Menasco lines up fabric with the foam backing before stitching. Not many people approach the end of their working life with the realization they have become one of a kind. David Menasco, the first to say that he specializes in very little, says he is the only craftsman in the Hood River Valley who specializes in leather upholstery. “When I started out, there were seven upholsterers in the valley,” says the owner and sole craftsman at Northwest Upholstery, operated out of his home at 5745 Trout Creek Ridge Road. “Now there are just two,” he says. David used to upholster furniture. Now he focuses his talents on car and boat interiors, with the occasional leather chair or sofa. He started out restoring cars, then decided he wanted to be a welder, which led him to enlist in the Navy, “because I thought with all those ships, they must need welders,” he says. Ten years later, he moved to Colorado Springs and started working in a series of steel fabrication shops. His father, an itinerant missionary Baptist preacher and welder, had settled in the Hood River Valley. One day, he called David, who was then living in Denver. After a quick visit to Hood River, David called his wife. “I told her, ‘This is the place I want to live and raise our family,’” he recalls. For five years, he and his father ran Menasco Trailers in Odell, building utility trailers to customer specs. After his father retired, David decided it was too much for one person to continue. He closed the shop and went back to work for other people. At Nichols Boatworks—where the Hampton Inn now sits in Hood River— David helped build two of the barges that Shaver Transportation runs up and down the Columbia. David was young and brash. He says his boss at Nichols wasn’t much better, so they went their separate ways. Twenty-five years later, David thinks he has softened some of those rough edges. “But there’s still men in this valley who won’t talk to me because of how I was years ago,” he says. A recent addition to the tools at Northwest Upholstery, this stand supports a roll of fabric so David can pull off the required amount. Six months later, in October 2011, David was in business. “I never set out to be self-employed,” he says. “It just happened.” At first, David focused on upholstering leather booths in restaurants, from Goldendale to Stevenson. That led him to develop a mobile studio so he could do his work on-site. Tucked in the weeds out back, a few personal projects await. As an example of the hill ahead, David figures it will cost him $20,000 to bring the 1950 Chevy panel truck back to life. For more information, call David Menasco at Northwest Upholstery at (541) 806-3773 or email dpmenasco@hrecn.net.